Following the news that a lawsuit between Apple's Beats and Bose had been settled, all Bose products —including both headphones and speakers— have been removed from Apple's online store. A rumor first surfaced a week ago claiming that Apple was planning to remove Bose sound products from its stores. On Friday, that became a reality, when all of the company's headphones and speakers disappeared from the online storefront. Though the products are no longer available for purchase, as of Friday afternoon queries such as "Bose Headphones" and "Bose Speaker System" still showed up in the search bar as suggested topics. 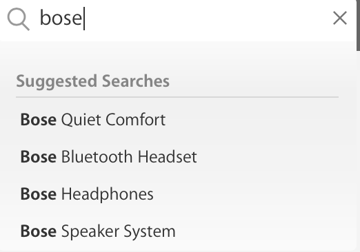 As of Friday, Bose products still showed up as suggested searches, but were not available to purchase through Apple. 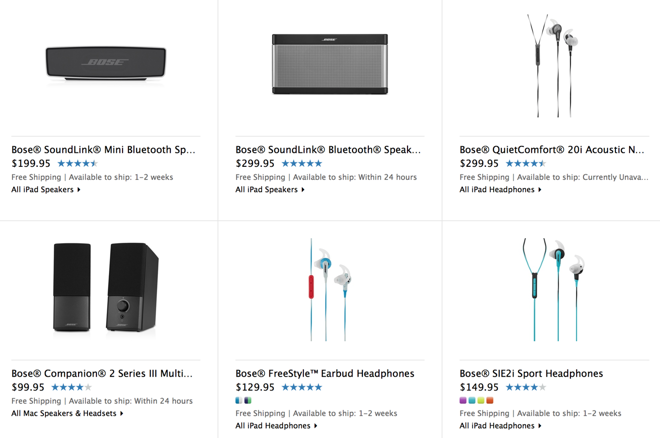 As of last week, Apple's online store listed a total of 17 Bose products, including a range of SoundLink Bluetooth speakers, and its popular QuietComfort series of noise-canceling headphones. It was Bose's noise-canceling technology that prompted the company to file a lawsuit against Beats in July, accusing its Studio and Studio Wireless series of infringing on its patents. But one week ago, Bose announced in court that it had settled its patent infringement lawsuit against Apple's Beats. It's unknown whether the removal of Bose products from Apple's store was part of the terms of the settlement or if another reason was at play. The settlement between Beats and Bose remains confidential. Bose products in Apple's store last week. As of Friday they were removed. It could also be that Apple simply prefers to spotlight its own brand rather than competing products from Bose. 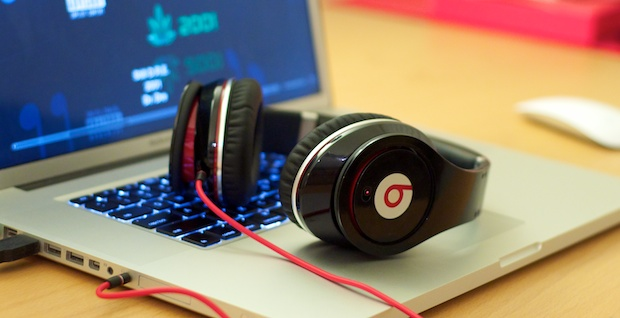 The company purchased Beats for $3 billion —Apple's largest-ever acquisition —back in May. Also a potential reason is a public spat between Apple's Beats brand and Bose over sponsorship deals. The National Football League has banned its players from wearing Beats products when conducting interviews, including 90 minutes following the end of a game, because of an exclusive partnership that has made Bose the official audio sponsor of the league. The issue came to a head last week when it was revealed that the NFL had fined San Francisco 49ers quarterback Colin Kaepernick $10,000 for wearing a pair of pink breast cancer awareness-themed Beats headphones at a post-game press conference. Apple executive Jimmy Iovine, who cofounded Beats, commented on the controversy last week and said he was thankful for it, concluding that pressure from Bose has resulted in cheap publicity for Beats. He said that players are now putting black tape over the Beats logo to avoid fines from the NFL. "It's like, I can't believe I'm this lucky," Iovine said. "I feel like sending them the tape."